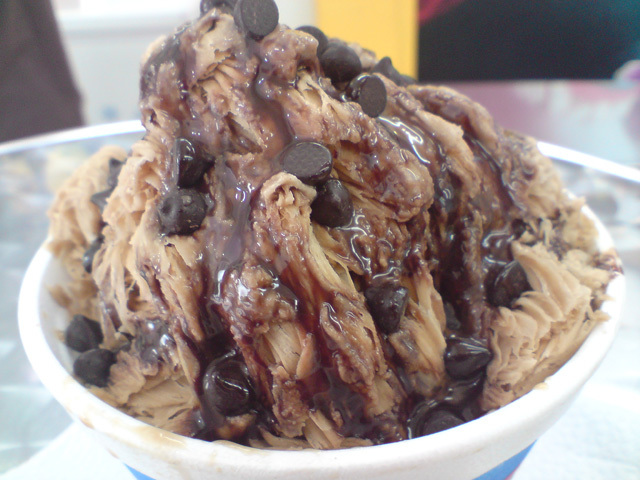 I have always been a big fan or ice blended or ice kacang or ice shavings especially on a hot sunny day. This place called 100 yen shop caught me by surprise as it is more like a convenience store rather than a shop selling drinks. The 100 yen shop has by far the best ice shavings I ever had. The difference with this one is, the ice is already flavoured & after grinding it, once eaten, is really like snow where it simply melts in you mouth, unlike ice kacang or other ice blendeds where you can still crunch on the small bits of ice. The flavour also does not taste ’synthetic’ or fake unlike 7-eleven’s slurpee or some bubble teas. This is an absolute must try for ice blended lovers. This entry was posted on Tuesday, October 14th, 2008 at 12:27 am	and is filed under Cafes, Heavenly Klang Valley Food. You can follow any responses to this entry through the RSS 2.0 feed. You can leave a response, or trackback from your own site.